View our range of roofing supplies below that we sell online for the building and construction of temporary roofs. This type of roofing material is mainly used for temporary roofs but can also be used for other types of projects. This is a temporary sheeted structure that is designed to offer cover over an area to protect it against the weather or dust etc. It is erected using steel scaffold poles as the structure and aluminium tube beams for the roof cover, the design of the pitch is dependent on what space or area you need to cover but you can have a simple mono-pitched shape, apex or multi-pitched roof. Corrugated iron sheets are then fixed to these beams to create the roof covering. Also, for extra protection Monarflex sheeting is added to the perimeter of the structure. What are the benefits of tin hats? No project delays due to adverse weather. Add privacy to your project. Here are details of the roofing supplies that we stock below for a temporary roofing structure. A corrugated iron sheet which can also be known as CI sheet or tin sheet are the traditional materials to use to cover the roof area. Once the scaffold has been erected around the building the CI sheets are then placed overlapping each other and secured to the roof trusses using a roofing coupler. These sheets can be re-used time again, but safety is always a must as they are extremely sharp, and we advise extreme caution when handling these sheets. 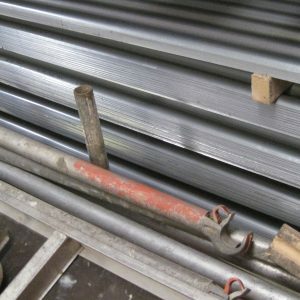 Used alongside conventional tube and board scaffold, aluminium beams offer a high load bearing capacity and can be used for the following: temporary roof structures, provide openings where scaffolding cannot be erected, mobile platforms, birdcages, crash decks and any type of scaffolding where a load is spread to gain access where scaffold cannot do so from the ground. They are available in various depths and lengths. Our roofing couplers which are otherwise known as “Wrigley’s” are what connects the CI sheets to the roof, which means you do not have to drill holes in the sheeting as they are secured using the couplers. They are made from pressed steel and zinc plated for extra-long usage. Is another type of scaffolding system that can be used to create a temporary roof, it is simple to construct, and can be adaptable to all types of buildings or other needs? You can also use Haki staircases for internal areas of your temporary roof. If you require roofing supplies or a product that is not listed on our website, please contact us as if we do not have it readily available in our stock, we can always order it in for you. When you place an order with us, we will receive an email confirmation of your order, we will then be in touch with you to confirm your delivery cost. Our charges vary and are calculated dependant on the following: size of order or quantity of items and also your location. We always try to keep our delivery costs as reasonable as we can. Unfortunately, we do not currently offer collections from our depot, but this will be something that will happen in the future and we will update accordingly. What is your minimum order for roofing supplies? In relation to our minimum order: anyone purchasing these for a tin hat in particular will most likely cover our minimum order quantity to qualify for delivery, however, please view each product listing as we do state the quantity in which you have to purchase to qualify to have your roofing supplies delivered otherwise please drop us a line to confirm.